Dams and river regulation created an urgent need to significantly reduce the risk of flooding on the Upper Rhine. 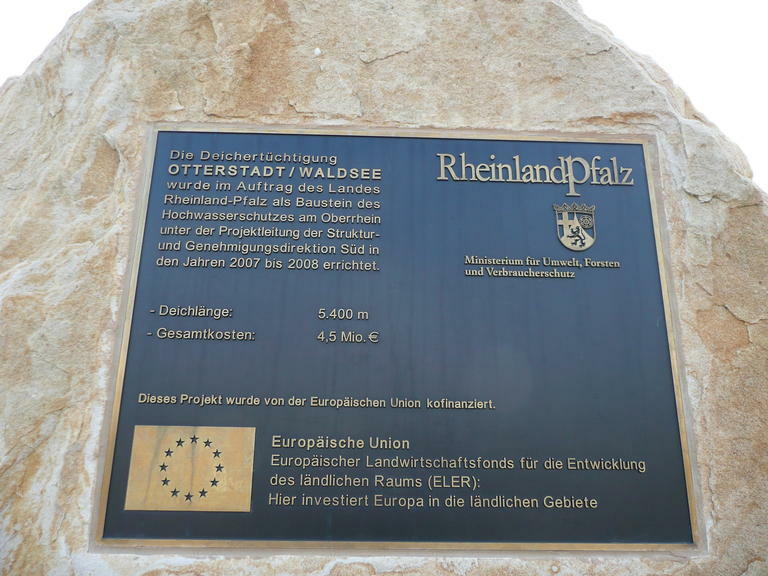 With this project the federal state of Rhineland-Palatinate aims to restore safety to levels existing prior to the river's regulation. In the Upper Rhine area flood peaks stream into retention areas, which were created through redeployment of existing dikes or construction of polders partly reestablishing temporary natural flooding areas that were cut off for other uses. Failure of flood protection could mean losses of up to 13 billion Euros for the many people living and working in the Upper Rhine valley. Therefore neighbouring areas protected by flood retention facilities cooperate to upgrade and strengten existing dikes. Rhineland-Palatinate aims to restore safety to levels existing prior to the river's regulation. Responding with pioneering measures to the need to protect citizens living and working along the Upper and Middle Rhine, this has grown into a joint flood protection concept with neighbouring federal states. Overall, the cooperation will realize 288 million cubic metres of water retention volume in the Upper Rhine area, of which 62 million cubic metres will be provided by Rhineland-Palatinate. Upgrading works involved approximately 3,700 m of the dike's landside and 1,700 m of its waterside. Culverts, pipe crossings, closings and dike crossings were adjusted. To protect a nature conservation area, a vertical sealing element was inserted along 1,470 m to a depth of 12 m, applying the so-called "mixed-in-place" (MIP) method: using augers, a bentonit-cement slurry is mixed with and added to soil layers. Forming a solidified and dense sediment, this allowed for an overall slimmer dike. The dike was upgraded from Otterstadt to Waldsee, where it connects to the planned flood retention area Waldsee/Altrip/Neuhofen, featuring a new supporting body and water-side sealing layer. The main Rhine dike's previous surface was peeled off, stored and re-applied onto the new structure. The MIP-method helped avoiding larger deforestation for the new dike. It also improved protection against the pressure of flood water, thus reducing the need for larger landfill in the dike's hinterland. To protect the dike's vegetation, seeds were extracted from an ecologically particularly valuable section of the existing dike and applied in the same section on the landside of the new dike's surface. Aiming to stabilize the local bat population 30 bat boxes were installed around the construction area. During construction the tadpole shrimp 'Triops cancriformis', living in a wetland area on the dike's landside, was carefully secured against damage. Upper Rhine valley, Rhineland-Palatinate, between the municipalities of Otterstadt (dike-km 7,1) and Waldsee (dike-km 12,5).